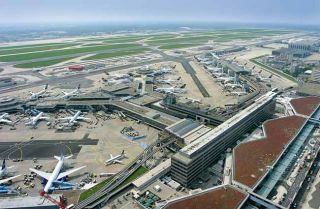 A leader in airport Web site functionality, Frankfurt Airport's site at www.airportcity-frankfurt.com offers booking services for flights, cars and hotels to help make the air travel experience easier for passengers. Millions ofpeople find air travel frightening and exhausting, but for many the mostdaunting part isn't the flight itself. It'sgetting to and through your departure airport and at your destination navigatingyour way from the plane to the street outside. Even afterfighting traffic jams or manhandling heavy bags on and off public vehicles,when you reach the airport the hard part of the trip has just begun. You have tomake sure you're at the right terminal and that you and your bags are checkedin. After you've passed through security, often a slow and anxiety-inducingprocess, you have to find your gate--not always simple in a big airport stuffedwith shopping malls. At yourdestination, the process can be just as confusing, particularly if you'reflying internationally. But avariety of existing and new technologies should make things easier for flyers,says travel technology expert Nawal Taneja, chairman of the Department of Aviation at Ohio StateUniversity. TheInternet has already assumed a crucial role in facilitating air travel.Airlines now rely greatly on the Web for bookings. Many now charge an extra feefor a telephone booking and some won't even let you make reservations by phoneor through a travel agent. Internetcheck-in is commonplace and through their Web sites airports and airlines areproviding flight schedules and updates on the timing and progress of individualflights. Some airports, such as Frankfurt and Amsterdam, also offer flight,hotel and rental car booking on their sites. Boston,Portland and Montreal airports are innovating in a different way. Their siteshost computer-graphicAirport Wayfinder videos that are designed tofamiliarize travelers with key airport features. Thesevideos can be designed to highlight the locations of parking, check-in, security,dining and retail facilities. Airports also can--and do--use them to showpassengers how to navigate through huge departure concourses and internationalarrival halls. Severalmajor airlines use the system, too, showing destination-specific videos inflight to help passengers navigate through the airportupon arrival and to provide local information. Airportsare also helping passengers in other ways. Many are offering remote check-inand baggage drop-off facilities at hotels, car parks, car rental offices andtrain stations. Auckland airport in New Zealandprovides signs informing passengers how long it should take to reach theirgates at a comfortable walking pace. Airlinesand airports have begun using radio frequencyidentification device (RFID) tags attached to luggage to route checked bagsautomatically to the right flight and to make it easy to find any wronglyrouted bags. Eventually,512-bit RFID tags will be incorporated into luggage during manufacture, sayexperts at RFID manufacturer FKI Logistex. Yourluggage tag will be reprogrammed every time you take a flight, providing fulldetails of your exact routing--including connections--and how to contact you ateach end of the flight. Soon, hopefully, airlines may find it much harder tolose a suitcase. Together,RFID and wireless communications will transform the airport experience, said Taneja. Airlines and airports already send text messages topassengers' cell phones providing updated flight information. But that is justthe beginning. Manufacturerssuch as Nokia are developing 'teleconvergent' interactive mobile devices containing GPS position-locating chips, RFIDtags and enough processing power to provide "analytics," as well as audio,video and text capability. In thefuture, not only will passengers be able to use their handhelds to avoidtraffic jams on their way to the airport, but when they reach it their wirelessunits will be invaluable. GPS-enabledhandhelds will allow passengers to navigate airport terminals easily and on areal-time basis they will identify the shortest security lines, blocked exitsand gate changes, said Taneja. The units' analyticswill tell passengers how long it will take them to reach their gates and ifthey can make their connections. Airlines willbe able not only to let passengers check in through their cell phones--Japan'sAll Nippon Airways already does so--but also to send barcodes to mobile units toact as boarding cards, said Taneja. Shouldpassengers go to the wrong terminal or become too absorbed in shopping and missboarding calls, airline gate staff will be able to "blip" them both to alertthe passengers and to show staff exactly where passengers are. This will allowairlines to decide whether to close a boarding gate on time or even to offloadbaggage if checked passengers can't be located. Meanwhile X-ray screening technology is becoming socapable of showing the details of people's bodies that in the future passengersmight have to decide between 'privacy' and 'non-privacy' security lines, said Taneja. They may have to choose whether or not to join whatmight be a quicker-moving line at the expense of displaying very privateinformation to security staff.